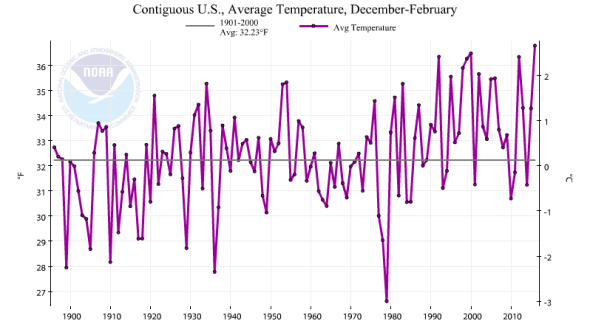 NOAA data show warmest winter on record in USA. This map pretty much says it all. In news that will surprise exactly no one, we just finished America’s warmest winter in history. NOAA blames the recent warm weather on a record-strength El Niño “and other climate patterns,” most notably, global warming. As a whole, this winter in the lower 48 was about 4.6 degrees Fahrenheit warmer than the 20th century average: a sharp contrast to the previous back-to-back frigid polar vortex winters, especially in the Northeast. But that doesn’t mean there was a lack of wintry weather: New York City, for example, had one of its warmest and snowiest winters on record, an odd combination to say the least. This year, all six New England states were record warm, and there was only one tiny speck of blue on the entire wintertime temperature map of the lower 48, though you’d probably need a magnifying glass to find it. (Hint: It’s near Yellowstone National Park.) Alaska’s winter was more than 10 degrees Fahrenheit warmer than normal—continuing a streak of recent exceptionally warm winters that’s raised questions about the future of the legendary Iditarod sled dog race, which is currently underway. Later this week, President Obama and Canadian Prime Minister Justin Trudeau will jointly announce a series of measures designed to slow the impact of climate change in the fragile Arctic, which is warming at a rate twice that of the rest of the planet. Looking ahead to the rest of March, this summer, and this fall, lingering El Niño conditions combined with the ever-present steamroller of rising global temperatures will probably mean warm weather will continue for virtually every square inch of the country. Temperatures along the East Coast, for example, will rise into the 70s over the coming days, nearly 30 degrees warmer than normal. Tuesday’s data release from NOAA doesn’t address global February temperatures, which have been much discussed after preliminary and unofficial data showed a substantial spike in global temperatures above January levels, which were the most unusually warm ever measured. Global temperature data from NOAA for February will be released on Thursday, March 17. Winters are warming, and this was the warmest one yet.